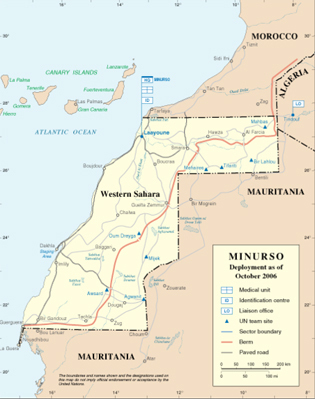 The conflict over Western Sahara between Morocco and the Polisario Front has been in the agenda of the Security Council for close to 20 years, when the Council took up the issue and established MINURSO, the UN mission in Western Sahara, to organize a referendum of self-determination with independence or integration with Morocco as possible outcomes. Throughout this period, the UN cannot show any real progress toward resolution of the conflict, other than occasional outbursts of optimism, that eventually have come to naught. Efforts toward a political solution have been at an impasse since June 2004 when James A. Baker, III, the first Personal Envoy of the Secretary-General in charge of such efforts resigned from his position. These efforts had been undertaken in order to move the parties away from the winner takes all solution envisaged by the referendum on self-determination under the UN Settlement Plan, once it became clear that the referendum would not happen in the foreseeable future, if ever. In April 2007, the Security Council adopted resolution 1754 asking the parties to negotiate without preconditions, under UN auspices, with a view to achieving a just, lasting and mutually acceptable political solution which would provide for the self-determination of the people of Western Sahara. The resolution was adopted within days after Morocco submitted a proposal granting autonomy to its “southern provinces”, as it refers to Western Sahara, within the framework of the Kingdom’s sovereignty, national unity and territorial integrity. Morocco had promised to submit such plan after it rejected in April 2004 the Baker Peace Plan because it had proposed that a referendum of self-determination with independence one of three possible options be held, following a 5-year period of autonomy. A day ahead of Morocco, Polisario submitted its own proposal to reach a solution through the Baker Plan and offered guarantees to Morocco, in the event of independence. Resolution 1754 came about after then Personal Envoy Peter van Walsum had concluded that proposing another plan would be pointless given the parties’ entrenched positions and suggested negotiations without preconditions. The Council responded to van Walsum’s suggestion only after Morocco submitted its autonomy proposal which the Council called “serious and credible” while only taking note of that by Polisario. Calling the Moroccan proposal “serious and credible” while in reality Morocco’s supporters considered it anything but, further complicated the UN efforts to work out a solution. A review of resolution 1754 raises questions about whether the Council’s request could really resolve the conflict. Events up to date seem to answer this question in the negative. The reasons can be found in the wording of the resolution and the state of affairs surrounding the situation. Firstly, the resolution does not elaborate on the meaning of “negotiations without preconditions”; or the Council’s expectations of what should be negotiated. As a result, each party interpreted it differently and each proceeded to advocate and stay with its own position during the sessions. Secondly, the call to work toward a mutually acceptable political solution, which implies a compromise satisfying both parties, is contradictory to the concept of self-determination through choice by the people. Moreover, the Council’s call for self-determination overlooks Morocco’s claim of “sovereignty” in its offer of autonomy. Neither Polisario nor any government accept such claim. Finally, Morocco feels its proposal is more widely accepted since the resolution welcomed it as “serious and credible”. For Polisario, all that matters is that both proposals are on the table and insists that both ought to be discussed. Neither the Security Council as a whole, nor individual states within or outside the Council have taken into account that both sides have stood firm by their same positions since Baker resigned. Morocco does not accept any solution that would include a referendum with independence as an option; for Polisario, an act of self-determination must include such an option. So far, neither the Security Council nor individual states with influence on one or the other side, seem willing to pressure them to make some concessions to meet the concerns of the other side and find a solution. The Security Council has ignored reality and has repeated the language of 1754 in all its subsequent resolutions up to April 2010. As for individual states, each praises the position of their protégé. Somehow, the majority seems to think that keeping the process going and having meetings where nothing resembling negotiations takes place will result in a miracle that will resolve the problem. The parties met four times in 2007 and 2008 under Personal Envoy van Walsum where each stood firm by its own position. Communiqués issued by van Walsum in agreement with the parties at the end of each round, stated that during the meetings the parties continued to express strong differences on the fundamental questions at stake while at the same time reiterating their commitment to continue meeting. However, in his briefing to the Security Council in April 2008, van Walsum informed the Council that the exchanges during the four rounds could hardly be characterized as negotiations. Pointing out that having both parties’ irreconcilable proposals on the table hindered the negotiations because it only made each side to stand firm by its own rigid position, he suggested that both proposals be taken off the table as negotiating without them would be based on two realities: (a) that the Security Council would not make Morocco accept a referendum with independence as an option; (b) that the UN would not recognize Moroccan sovereignty over any part of Western Sahara. Van Walsum asked for clearer guidance from the Council because if the Council could not make a choice, the parties would not be able to either. Despite this, subsequent resolutions ignored the key points of van Walsum’s briefing and repeated the same request. In August 2008 van Walsum’s contract was not renewed after Polisario and Algeria accused him and his proposal of partiality toward Morocco and asked for his removal. However, the UN confirmed that the Secretary-General would appoint another Personal Envoy soon because he remained committed to offer his good offices and firmly believed in the need to revitalize the negotiating process. Christopher Ross was named as Personal Envoy on January 7, 2009. Rather than organize a fifth round, Ross announced that the parties would meet for informal talks prior to a fifth round, which he hoped “would make an important contribution to the search for a resolution to the conflict”. With its usual optimism the Security Council approved his proposal and “called upon the parties to continue to show political will and to continue negotiations without preconditions and in good faith”, ignoring that so far no negotiations had taken place and neither party had shown any good faith. Ross has held five rounds of informal meetings between the two parties with Algeria and Mauritania also attending. (Both states were named in the original UN settlement plan as neighboring countries with interest on the issue and have been included in all negotiations as observers since the time of Baker). At the end of each round including the most recent in January 2011, Ross, with the agreement of the parties, issued a statement that the discussions had taken place in an atmosphere of serious commitment, honesty and mutual respect but that neither side had been willing to discuss the other side’s proposal while they both reiterated their commitment to continue their negotiations as soon as possible. During the last two meetings, at the request of the Personal Envoy who urged the parties to adopt forward, innovative approaches, Morocco put forward proposals to advance the process. At the end of the meeting the Moroccan Foreign Minister pointed out that the concrete ideas were relevant to the on-going process and not to the political process. The substance of Morocco’s proposals as reported by the Moroccan official news agency include assessing the Territory’s natural resources “in order to refute the Polisario’s false claim on the exploitation by the Kingdom of these resources”; enlarging participation to the negotiations to include representatives of the “southern provinces”; questioning whether Polisario really represents all Saharans and not only those held up in the camps; and how to make Algeria’s contribution more constructive in order to reach a solution respecting Morocco’s sovereignty. Proposals hardly conducive to making the other side open and willing to take them up. After the December 2010 meeting Polisario wrote to the Security Council warning of serious risk of collapse of the process because Morocco had refused during the session to discuss Polisario’s proposal as requested by the Personal Envoy and accusing Morocco of obstructionism. At the conclusion of the January 2011 meeting, the leader of the Polisario delegation indicated that Morocco had continued to avoid real negotiations wishing to perpetuate the negotiating process indefinitely, adding that without prejudice to the territory’s final status both parties had presented ideas to reinvigorate the negotiations while stressing that the conflict must be resolved on the basis of respect for the inalienable right of the Saharawi people to self-determination. This is not unusual. The statement by the UN indicating willingness by all sides to continue meeting followed by those of both parties accusing the other of inflexibility while stressing that its preferred solution is the only reasonable one, has been the pattern since the negotiations without preconditions have started. The political impasse will continue unless the Council and the key players change their approach to dealing with the conflict. After Morocco rejected Baker’s 2003 Peace Plan there was no soul searching by the Secretary-General or the Security Council as to what should happen next. The Secretary-General continued to give reassurances to the parties that the United Nations would assist them to resolve the conflict. The subsequent appointment of two Personal Envoys (Peter Van Walsum, 2005-2008; Christopher Ross, 2009- ) has only helped perpetuate the conflict for another six years and harden the parties’ incompatible positions. Predictably this strategy has failed so far to make any inroads toward a solution and nothing indicates that will change any time soon. However, everybody appears comfortable with this route, keeping the process going and maintaining the status quo while the situation on the ground keeps deteriorating with the potential to get out of control. France has been a steadfast supporter of Morocco being its number one trading partner, primary creditor and foreign investor with close business and social ties. The ties between the two have been and remain extremely close since the time that Morocco achieved independence from France and French political and other elite maintain second homes and spend vacations in Morocco. At times, France has acted as spokesman for Morocco in the Security Council and within the Group of Friends and has supported the UN position only when Morocco has been comfortable with it. It has shown no hesitation to stand alone from the rest when this suits Morocco. So far no other Council member has challenged France to use its veto when disagreeing with a resolution. Starting in 2004, after the Madrid bombing and with the election of the current government, Spain has also moved closer to Morocco and away from its more nuanced position. Security (cooperation in counter terrorism given that several of the bombers were Moroccans, in counter-narcotic measures and illegal migration from Africa) and business (Morocco being a major trade partner and Spain getting the lion’s share from the EU fisheries agreement with Morocco) are playing a major role in the current government’s stance. However widespread public support for Polisario in Spain and much needed cooperation with Algeria in the energy sector have caused Spain to oscillate in its position, which has often further complicated the situation. Although Spain is not a permanent member of the Security Council, for historical reasons it has been one of the founding members of the Group of Friends of Western Sahara — the US, France, UK, Russia and Spain — and as such it plays a key role in negotiating the various resolutions even when it is not in the Council. China and Russia have been inconsistent in their positions due to contradictions in their own internal/external politics. China sees itself as supporter of the developing world, but will not take a position on self-determination that could raise questions about Tibet. Russia on the other hand, has been in more of a bind being caught between its position on Kosovo, the independence of which it protests vehemently, and the declared independence of Abkazia and South Ossetia, both of which it engineered and of which Russia is one of a handful of states to support. As for the US, from the start of the conflict it has been an undisputed supporter of Morocco although until April 2004 it maintained a more neutral, hands-off position supporting UN efforts, especially when Baker was the Personal Envoy. In July 2003, the US was instrumental in getting France on board the Security Council resolution supporting Baker’s plan, even though Morocco had indicated that it was not happy with it. In April 2004 however, when Morocco rejected the plan outright, the US weakened its support and joined France and Spain in supporting a solution based on Morocco’s promised autonomy proposal. Morocco’s cooperation on counter-terrorism and its perceived supportive role on the Israeli-Palestinian conflict were the key factors influencing the US to depart from its previously more neutral approach. As a result the US took the initiative to persuade the rest of the Security Council in its April 2007 resolution to call Morocco’s autonomy proposal “serious and credible,” a formulation that has found its way into subsequent resolutions and unilateral statements by individual supporters of Morocco. It has transpired through Wikileaks however that the US, as well as the UK, Spain, Germany (then president of the EU in the spring of 2007) and even France, were seriously unimpressed by Morocco’s autonomy proposal, when first presented to them in March 2007. Nevertheless, during a meeting of political counselors of the above-mentioned states in Rabat, in response to the intensity of Morocco’s insistence, the decision was made to advise Morocco to proceed and submit its proposal to the UN and to support it despite its shortcomings. And at France’s suggestion, the proposal was singled out for praise in the resolution. In further information from Wikileaks it appears that the US is aware and uncomfortable about the very high level and centralized coercion and dishonesty in Morocco. From the same sources it transpired that the military at the most senior level holds massive investments and exploit the natural resources in Western Sahara. Similar sentiments were expressed by the US about the situation in Tunisia, which, as it turned out, was well known to the people of Tunisia. As US cables from Morocco indicate, well-founded knowledge of the situation in Morocco prevails among its people although nobody dares speak openly about it. Maybe to mitigate such revelations and to also stress its indispensability on counter-terrorism Morocco recently intensified its strategy of linking Polisario with Al Qaeda in the Islamic Maghreb (AQIM). In this Morocco has found willing partners among some in the US media, who tend to present their own opinions as news while quoting almost exclusively Moroccan government sources. Such allegations are vehemently disputed by Polisario leaders themselves and outsiders knowledgeable of the facts. 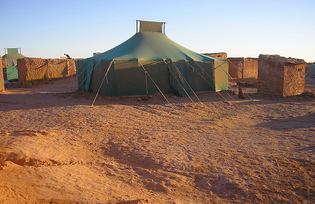 The tragic events in the make shift camp outside Laayoune in Western Sahara, which Morocco’s handling exacerbated, according to the Amnesty International report on the events, are used for this purpose as is a purported discovery by Morocco of a terrorist cell in the country. Documents released by Wikileaks suggest however that even Moroccan officials in secret do not believe their own state-media propaganda linking Polisario to AQIM. The recent discovery of an “Al Qaeda” arms cache in Western Sahara, quickly attributed to Polisario by Morocco, later turned out to be the work of Moroccan army officers involved in illegal weapons smuggling. Although the Obama Administration does not openly follow the pro-Moroccan policy of the second term Bush Administration it has comfortably fallen back in supporting the UN strategy no matter the lack of results. The question is, can the US afford to continue with such hands-off policy given the stakes in North Africa after the events in Tunisia? A tragic but not entirely unexpected development has been the self immolation of a young Saharan who had been among those protesting luck of opportunity and employment in the city of Smara in Western Sahara subsequent to the events in Tunisia. Similarly, the US cannot ignore Algeria’s importance in the hydrocarbon business and counter-terrorism cooperation, especially since the creation of AFRICOM. After the events in Tunisia, the top US counter-terrorism official visited Algiers to discuss AQIM and the dangers it holds for the Sahel region. The US recognizes Algerian importance and supremacy in this regard although as Wikileaks reveal the US is concerned about internal corruption, political paralysis and dissatisfaction which has coincidentally manifested in recent internal unrest. This necessitates that the US tread carefully between its two North African allies, Morocco and Algeria. However, keeping the conflict over Western Sahara on the back burner while pretending there is actual movement towards peace, as many appear willing to do, steadily becomes less of an option. 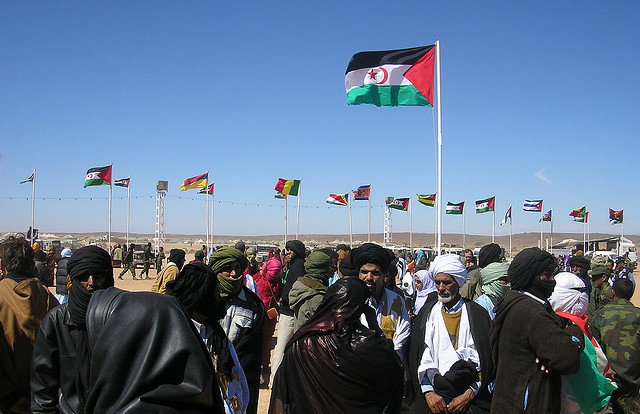 Polisario has undisputed support in its calls for self-determination (read: independence) from Algeria, South Africa, Namibia, Cuba, Venezuela and several other countries, several parliaments in Europe as well as several members of the US Congress. Polisario and its many supporters, state and non-state, expect no less than the holding of a referendum on independence. Morocco’s supporters have a lot of explaining to do when they talk about self-determination and Morocco’s “serious and credible” autonomy proposal in the same sentence. An act of self-determination normally includes several choices for the people. All resolutions adopted by the UN General Assembly on Western Sahara provide for a referendum of self-determination with the option of independence. The Settlement Plan provided for this and the Security Council has included self-determination when approving a political solution. But, Morocco views Western Sahara as part of its territory, while Polisario and Algeria reject this. As a result, linking self-determination (which each party interprets in its own way while standing firm by its own position) with independence, while no action is taken to make it happen, has only contributed to the irresolution of the conflict. In terms of unfortunate timing for the key Western states, the results of the referendum in southern Sudan which overwhelmingly support independence and which most Western countries, the US foremost, have no trouble accepting, will bring more into focus their inconsistency, which first became obvious with Kosovo. Combined with the situation in Tunisia where the will of the people to get rid of corrupt oligarchs is accepted and even praised, while the desire of a group of people to at least be given the option of deciding for their future, all the while paying lip service to self-determination will be hard to explain. Where does this all lead? The present trajectory will not resolve the Western Sahara conflict. Further meetings, formal or informal, where the parties talk over each other while fixed on their positions, are futile. The mediator needs to set goals which the parties should be pressed to consider seriously even if they do not meet their total aims. Rather than expect the parties to agree on their own to discuss each other’s proposal, the parties should be asked by those they are likely to listen to, to make concessions and undertake compromises that they are not willing to make and the Security Council should be asked to support such request in order to help resolve the conflict. The Council must abandon the “negotiations without preconditions” formula and demand concrete steps toward a definite solution. The ongoing UN strategy only helps perpetuate the stalemate by providing cover to both sides vis-à-vis their constituencies that something is happening while nothing meaningful is. Ross has a strong hand in that all concerned seem to want continuing UN involvement in the peace process. If the UN cannot follow a different trajectory it should abandon peacemaking efforts on Western Sahara. No doubt there is danger of terrorism in Morocco as in the rest of North Africa. And the situation in Tunisia, while still tenuous and unresolved is keeping the rest of North Africa, the US and the European Union nervous and anxious as to what next. However rather than coming from Polisario, a group that has never exhibited any inclination in its whole history towards the use of terrorism, it could come when unemployed, disaffected youth with nothing to do by way of work and no prospects of improving their lot decide that extreme action against themselves and others is their only option. 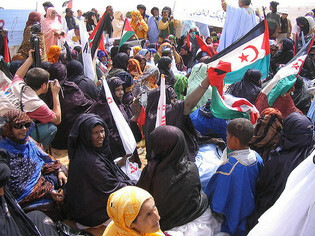 The Group of Friends of Western Sahara can assume a role of leadership and responsibility in the resolution of the conflict and this will only be effective if they address to both parties but especially to the stronger one, their demands for meaningful negotiations with hard concessions and a deadline for achieving results. A mediator can only be successful if he or she asks for concessions from the side that he or she is the closest to. Only in this manner will the other side trust the mediator and will have no argument when asked to also compromise. It is a given that both sides will try to use the situation in Tunisia to their advantage. Morocco will use the sense of uncertainty and fear of turmoil and unrest to point to its own indispensability for stability in North Africa in order to prevent the spread of militant Islamism. As for Polisario, it will point to the tolerance by the Western states of the Tunisian regime while they ignored the pervasive political and economic oppression and corruption of which they were aware, which resulted in the downfall of the Ben Ali regime. It will argue that something similar could happen in Morocco. Either argument could carry the day. While the situation in Tunisia should be instructive in dealing with oppressive, corrupt and unpopular regimes, consistency in policies and a sense of following the right path should have its own value for the West. The question arises whether real progress toward peace requires constant nudging by others or whether parties will move ahead when their own self-interest propels them to do so. An axiom of negotiations, that the mediator cannot want a solution more than the parties themselves, appears to be ignored in the case of Western Sahara. Since 1991 the parties have been supported and nudged by the UN with little to show by way of progress. Only the parties can exercise the political will necessary to reach an agreed solution if the UN is not willing to ask them to do something that they will not voluntarily agree to do. Key countries and supporters of both parties should ask themselves whether the time is ripe to stop paying lip service to the need for a solution while perpetuating the impasse. As the violent events in Western Sahara itself first and later in Tunisia showed, time for complacency needs to be coming to an end. Anna Theofilopoulou covered Western Sahara and North Africa in the Department of Political Affairs of the United Nations from 1994-2006. She worked closely with former U.S. Secretary of State, James A. Baker, III and was a member of his negotiating team throughout his appointment as Personal Envoy of the Secretary-General on Western Sahara from March 1997 until his resignation in June 2004.